Want to have the very best guitar students in your area, have new students begging you to teach them and have other guitar teachers envy your success? To do that, you need one thing above all else: the ability to CONSISTENTLY turn average guitar students into great musicians. This goes far beyond merely teaching them to “physically play” their instrument - it requires you to turn them into self-reliant and creative musicians. THAT is the Holy Grail of being a master guitar teacher and is a big part of why some guitar teachers earn 6-figures per year while others struggle to make ends meet. Good news is that teaching creativity to your guitar students is much EASIER than you think. More good news, most of your guitar teaching competitors are completely unaware of the importance of teaching creativity to their students, let alone HOW to actually do it. So when you learn how to teach guitar effectively (which includes learning to teach musical creativity to your students), you will have a massive advantage over all other guitar teachers in your area. Most guitar students believe in general that “creativity cannot be taught” This belief is simply false and has been proven to be false hundreds of times. (I’ve proven this with my own guitar students AND other guitar teachers whom I train to teach guitar have proven this with THEIR students). They feel insecure about their own ability to become creative musicians and think that they lack general potential in this area. This part is also false, because the potential to become musically creative is virtually identical in all people. Fact is, your students will ALWAYS struggle being musically creative for as long as they continue believing in those myths. It’s part of your job as a teacher to get these negative, disempowering beliefs out of your students’ minds and replace them with true, empowering ones. Until & unless you do this, your students’ lack of confidence in themselves will overpower anything you do to actually “teach” them to become more creative. There are 2 main ways you can change your students’ mindset on this topic. The first way is to explain to your students that musical creativity is NOT a mystical, magical ability that some musicians are born with, while most aren’t. In fact, “musical creativity” is not even a single “skill”. It is merely a RESULT of having mastered a variety of musical skills and integrating them together to make creativity possible (more on this below). Explaining this will already help your students see why the beliefs above are completely false and will make them excited about their TRUE potential. Your students never actually master most of what you show them (and never become truly creative musicians). Yes, you make your students (and yourself) feel good in the moment about learning “more” things in each lesson, but when it comes to being able to creatively use/apply what they know, they feel totally helpless. When your students “feel” like beginners long after they ceased being beginners, this is not good for their motivation and it’s not good for YOUR reputation as their guitar teacher. You (the guitar teacher) end up working a whole lot more hours than necessary (often unpaid) preparing new guitar lesson materials every week. In the end, everyone loses with such a teaching approach, and guess what…the VAST majority of guitar teachers teach in this EXACT way. (Now you know why the average student doesn't stick with guitar lessons for more than a few months (or maybe a year) and why most guitar teachers do NOT have many (or even no) great students). practice to get them better results. students how to easily play chords. Learn how to improve your guitar teaching skills and grow a business. The solution to this is so simple that it might shock you...but it’s also guaranteed to make your guitar students better and more creative players. You need to spend less time teaching your students “new information” and more time training them to apply and USE that information. Never assume that your students will figure out how to apply what you teach them on their own - 99.99% of them NEVER will. Instead (without training), these students will join the ranks of millions of guitar players who “know a lot of things” but cannot creatively use any of them. It’s part of YOUR job as a guitar teacher to not “stop” after teaching a new concept to your students and instead walk them through the process of applying it in many musical contexts. You must not be afraid to do this for “as long as it takes”, even if it means spending an ENTIRE 30-60 lesson training your students to apply a concept in dozens of contexts. Right now you may be thinking: “Tom, I don’t feel right taking my student’s money for a guitar lesson when I am not teaching them anything new…I feel like I'm cheating my students out of a lesson they are paying for.” My answer is: your students are NOT paying you for “guitar lessons” or to “learn information”. They are paying you for RESULTS. Your ONLY job as their teacher is to get them the result of reaching their musical goals. So the only time you are “cheating” your students is when you are not giving them the training they desperately NEED to achieve the result they want (become better guitar players). “Training” your students is one of the main keys to teaching guitar effectively and is NOT limited only to teaching musical creativity. To check how much you know about teaching guitar, take this guitar teaching skills test. Training your students to apply their musical skills will go a long way towards making them better and more creative guitar players…but it’s STILL not enough. Why? Because skills and elements of musical knowledge are NOT applied in isolation in real music. In other words, your students can only truly be creative with a certain skill when they can not only use it by itself, but also combine (integrate) it with all of their existing skills. All highly advanced guitar players already know and do this naturally when they practice guitar, but only top-level guitar TEACHERS understand the critical importance of helping their students to integrate their skills together…and even fewer actually DO it. One simple example of how to integrate skills together is getting your students to write their own very simple songs after first learning how triads are grouped into keys and learning to play barre chords. Instead of simply “teaching” the concepts to them in isolation and immediately moving on to more advanced chords or music theory concepts, STAY on these topics for a few more lessons and get your students to practice being creative and integrating these concepts to actually write something that resembles a song (under your guidance). This will not only help them to remember the main music theory topic better, but will also start them on the path to true musical creativity with the things they are learning from you. Make them feel great about the new process you are taking them through in your lessons. Once they feel the progress and the new level of musical freedom you are helping them develop, they will feel hungry for more! This approach is particularly important if you have students who hold the expectation that guitar lessons should be all about learning “new” things/information. Such students might initially be skeptical about spending their lesson time on application and integration assignments. So you MUST introduce this change slowly and back this up with making your students see their positive transformation with their own eyes. Example: one of the simplest (and most effective) things to do when teaching creative lead guitar phrasing, is having your students practice making lots of variations out of a short guitar lick. After teaching your students lots of nuances of guitar phrasing (such as vibrato, bends, slides, string rakes, double stops, etc.) challenge them to create as many variations as they can from a 3-5 note guitar lick. As simple as this sounds, it is incredibly fun to do and starts getting students thinking beyond “what” notes to play and focusing on “how to play the notes in the most creative way possible”. In my past guitar teaching articles I’ve discussed at length why teaching guitar using ONLY one-on-one private guitar lessons is holding back both your students’ progress and your income. (Learn why this is true in this guitar teaching business video). In addition, private one-on-one guitar lessons are especially limiting when it comes to teaching creativity to your guitar students. Why? Because no matter how great you are as a teacher, your guitar students’ learning experience will be limited to “only” you (in one-on-one lessons). Fact is, your students will learn and master musical creativity much faster and easier when they learn it in the context of a group class interaction. Being around other people and watching them go through the same process not only makes the lessons more fun, but it also helps students learn from each other and be inspired by each other’s progress. Does this go against every bit of conventional wisdom about teaching guitar? Yes it does. But you already know that conventional wisdom for guitar teachers has proven itself to be woefully ineffective. 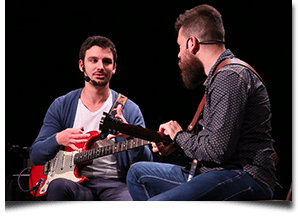 Once you learn how to teach guitar effectively, and combine better teaching skills with highly effective guitar lesson formats, your students will start to make unstoppable progress and YOU will become the “go-to” guitar teacher in your area. To get personal training from me on how to build a highly successful guitar teaching business, read this page about training for guitar teachers. Learn how to teach guitar for a living.